Before we embarked on our September adventure, we knew that the weather wasn't going to be great. Every day when we woke up we'd check the weather forecast so that we could make sure that we were indoors when the torrential downpour hit, but nothing prepared us for the amount of rain we got on our third day. The weather was absolutely dreadful but somehow Disney still managed to look beautiful, we had such a laugh and I'll never dread Disney in the rain again. It's all about making the most of what you've got. Day three was Plaza Gardens Day. Luckily for us all, I was a lot better this morning so I put my Eeyore Ears on, pinned my donkey bow to my pocket and headed into the park for a big cuddle from my favourite donkey. 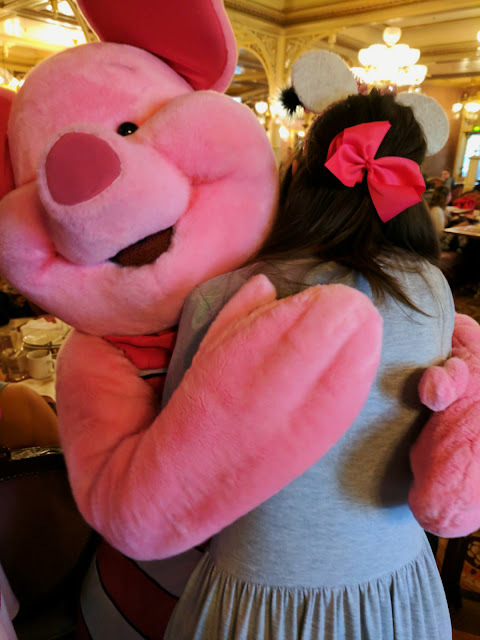 Our reservation was at 9:45 am and as we'd be meeting characters at breakfast, we decided to do some rides in Extra Magic Hours. Peter Pan's Flight had a very short wait time - we walked straight on and it was so magical. You don't need me to give you another talk about how much I love this ride - the part where you fly over London with 'You Can Fly' playing in the background gets me every time. When we came off the ride, we slowly walked over to Plaza Gardens to get our place in the queue. 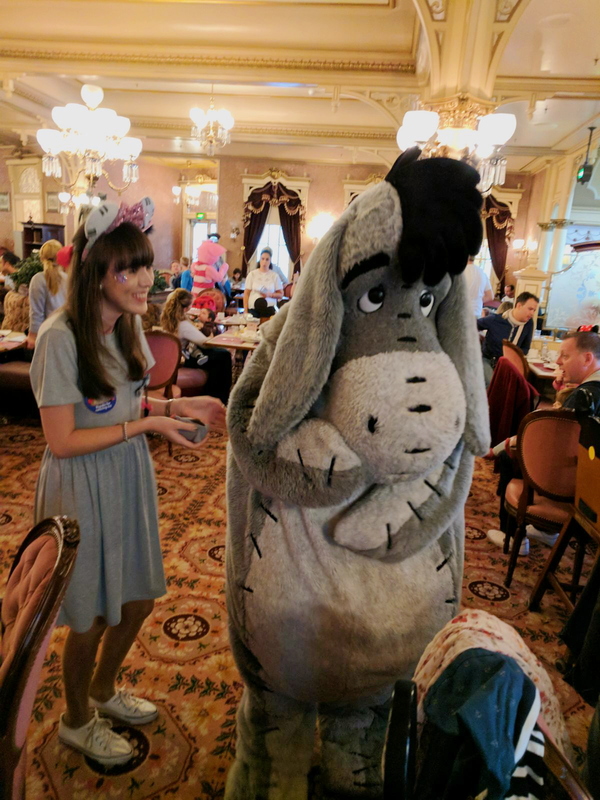 I'll admit, I wasn't expecting much from this character dining experience as our last breakfast at Plaza wasn't brilliant. I think the only highlight was seeing Eeyore's reaction to my bound - a reaction I was hoping to re-create this time around. We were shown to our table in the corner of the restaurant - which still has a poor layout - and knew that characters weren't going to be able to get to us. We went up to the buffet and filled our plates with all the pancakes and Nutella we could grab - if there's one good thing about this dining experience, it's that there's a really good selection of food for breakfast. I was really surprised at how busy it was especially because it was an off-peak season. Almost immediately, Pluto came running over the table. 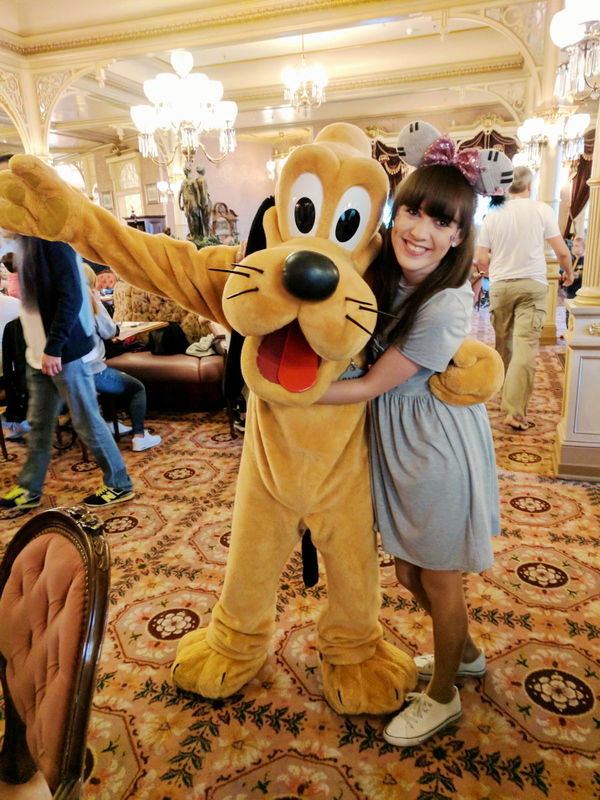 I love meeting Pluto, he's always so playful and he's one of my favourite Mickey and Friends characters. When I came for my Birthday when I was 18, I got the fluffiest Pluto plush and he still sits on my bed - he's my favourite plush I own. We had a big hug and I asked him if he was having a good day, he told me that he was hungry but that he was having a really lovely day. Then he noticed my ears and made a love heart with his paws, clearly, Pluto and Eeyore are the best of friends. We had a photo, another big hug and then he moved over to the next family. I'll admit that the character interaction in Plaza Gardens is very rushed which is probably why it's the cheaper character dining experience. Our interaction with Mickey was very quick - I don't think we got the chance to give him a hug or have individual photos taken. A lovely man on the table next to us offered to take a group photo for us and although the interaction was rushed, the photo is still super cute. Before I became a regular visitor to Disneyland Paris, I didn't appreciate the ducks as much as I should. However, now I absolutely adore them. I'd been planning what I wanted to say to Daisy in hope that we'd be able to meet her on this trip and when she came over, the conversation didn't disappoint. She gave me a big hug and I told her that she was looking very beautiful, to which she told me that I was too. When we went to take the photo I told her that I didn't know how to pose and asked if she could teach me. 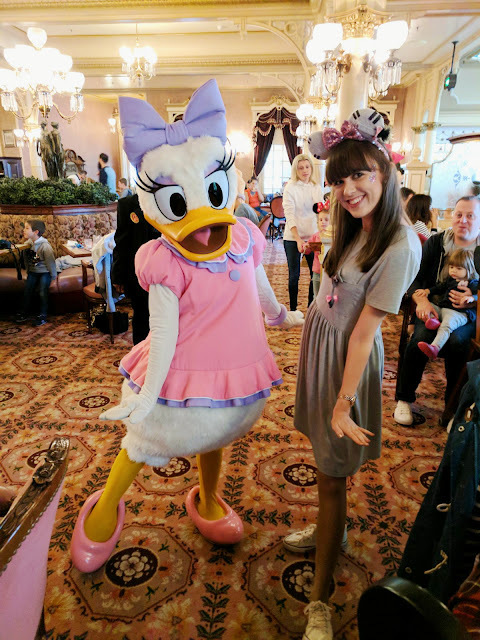 This is one of the best things that you can say to Daisy - she started to throw out some sassiest poses I've ever seen and got me to copy her. I wish I could be sassy like Daisy all the time. The characters took a quick break which gave us time to go and top up our plates and glasses. Then, it was time for the Hundred Acre Wood gang. 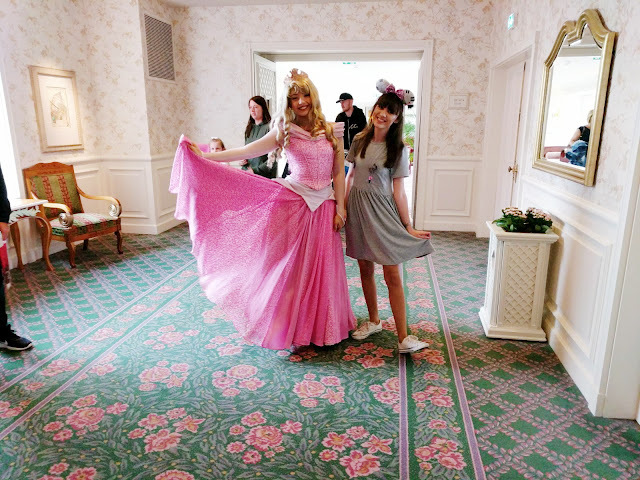 Piglet came over and was overly excited about Charlotte's Disneybound - seeing those two meet each other was adorable. Piglet is so cute and I'm so glad that we got the opportunity to meet this time around (Piglet was taken away before we got the chance to meet last time). I received the tightest hug and he told me that he loved my outfit, again pointing out my ears. He was also a fan of the glitter on my face and I promised that I'd bring him some next time. We had some adorable photos taken, had another big hug, he blew us kisses and went skipping away to another family. So I'll admit, I was really disappointed with my interaction with Eeyore. I'd been waiting to meet him all trip so when he blanked me and didn't take any notice of my bound, I was pretty gutted. I went up to him and gave him a big cuddle, telling him that he was my favourite, that my outfit was inspired by him and that I'd been waiting to meet him. He didn't take me on at all, put his arm around me for a photo and then walked off to the family next to us as I was showing him my tsum tsum. That right, Sara, Charlotte and Michelle didn't even get the chance to meet him - he just ignored them too. I know it sounds childish but when you try to give the characters a good experience by talking to them, you expect that to be returned. I don't mean spend ages with people because I understand that they need to see everyone but surely it'd be a better experience for everyone if they didn't get ignored. I think that Plaza Gardens needs to sort out their dining arrangements - either have the same amount of tables, fewer characters and longer interactions OR fewer tables, the same amount of characters and longer interaction. It's the interaction that lets the restaurant down. 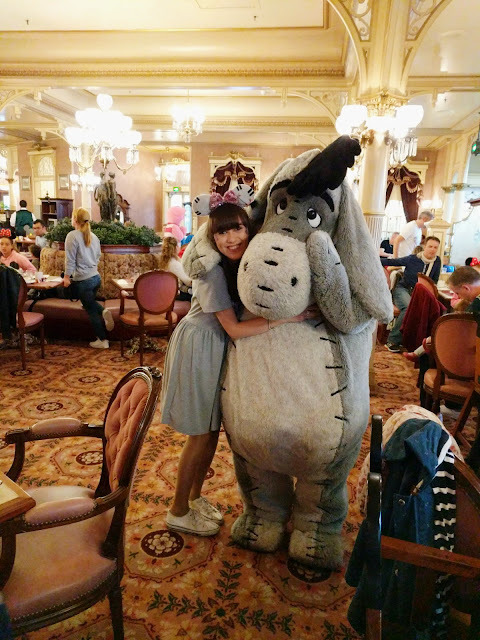 Despite this poor meet with Eeyore, he's still one of my favourites, maybe he was just having a down day. 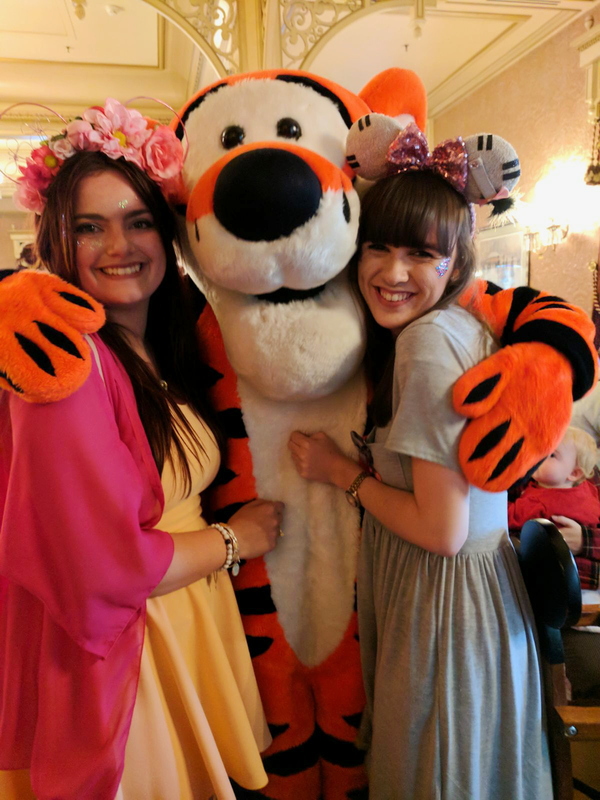 The last character to come and say hello was Tigger. 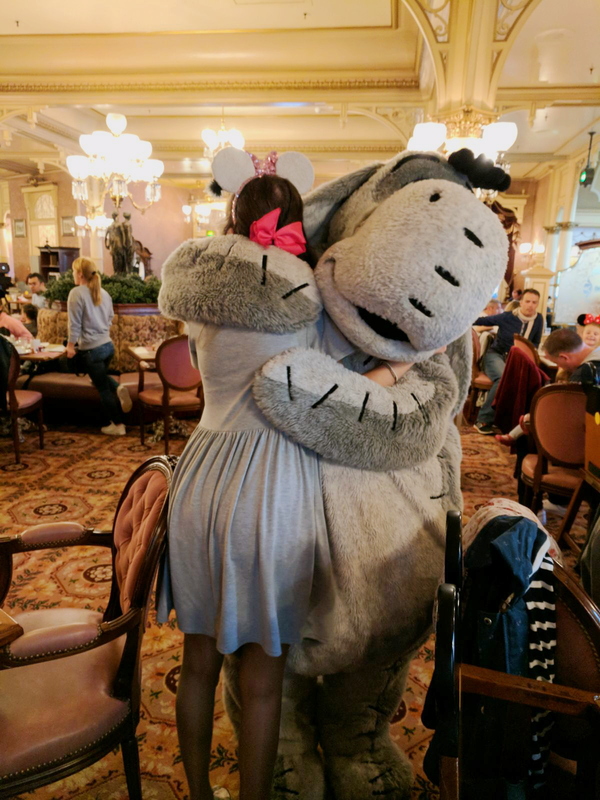 My love for Tigger has grown over this past year and I think he could tell that my Eeyore meet had got me down a little bit because he was full of love and very tight hugs. 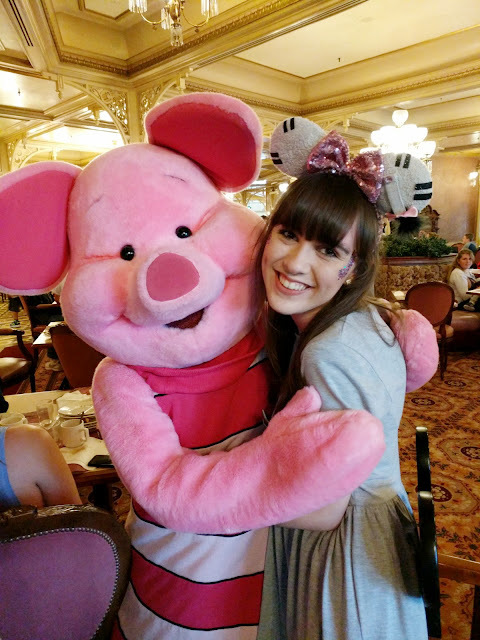 He was super happy to see his friends Piglet and Eeyore (Charlotte and I) and we had the cutest photos taken - as you can tell from my little face, he cheered me up so much and I'm the happiest little bean. We finished up at Plaza Gardens and walked over to Casey Jr where Pooh and friends meet regularly. 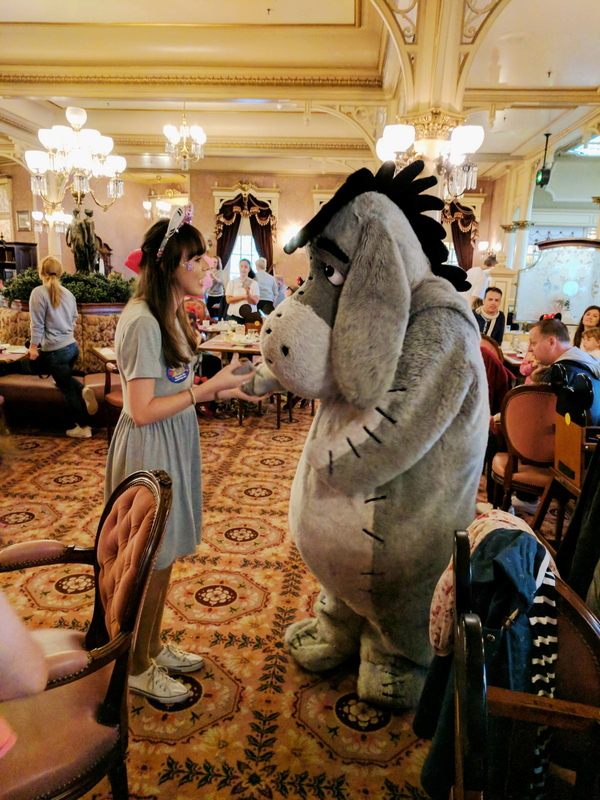 I was still down about my poor interaction with Eeyore so we waited in hope that he would be meeting with Pooh and I'd get a better interaction than Plaza Gardens had to offer. However, Eeyore was nowhere to be seen and instead we saw Pooh skipping towards us with Tigger following closely behind. We were going to leave the queue until we realised that with Charlotte and I bounding as Piglet and Eeyore, the main 100 Acre Wood gang would be back together again. This was too good an opportunity to refuse. Michelle and Sara went on Casey Junior and then went over to Castle Stage to save places for the Anniversary show, leaving Charlotte and me in the queue. 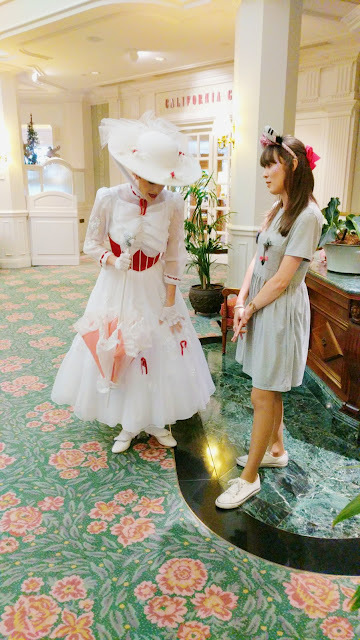 When we got to the front of the queue, we got talking to the lovely character attendant as she said that she loved our outfits. I asked her if she could tell who we were and she knew straight away, she promised that she'd make sure Pooh and Tigger made a massive fuss. 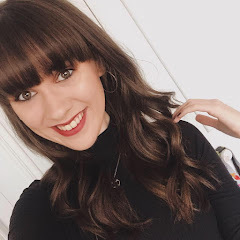 She also kindly filmed the meet and took some adorable photos for us - the video will be on my vlogs (when I finally decide to upload them). 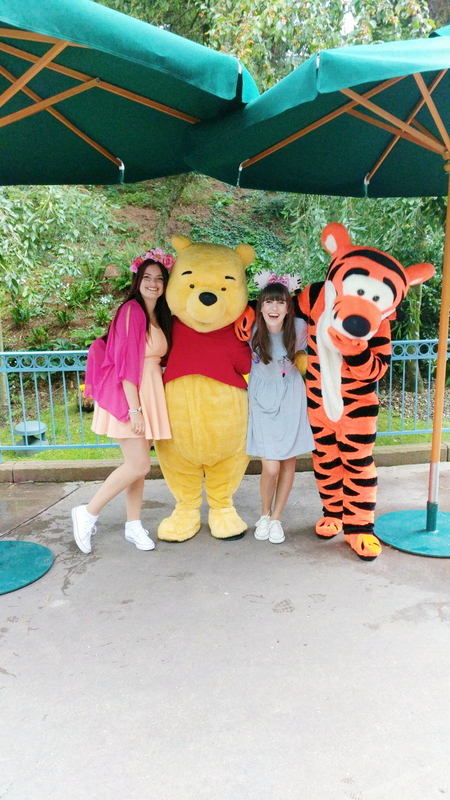 The character attendant told us to come and stand next to her and when the previous family had left, she shouted 'POOH! TIGGER! EEYORE AND PIGLET HAVE COME TO SAY HELLO'. 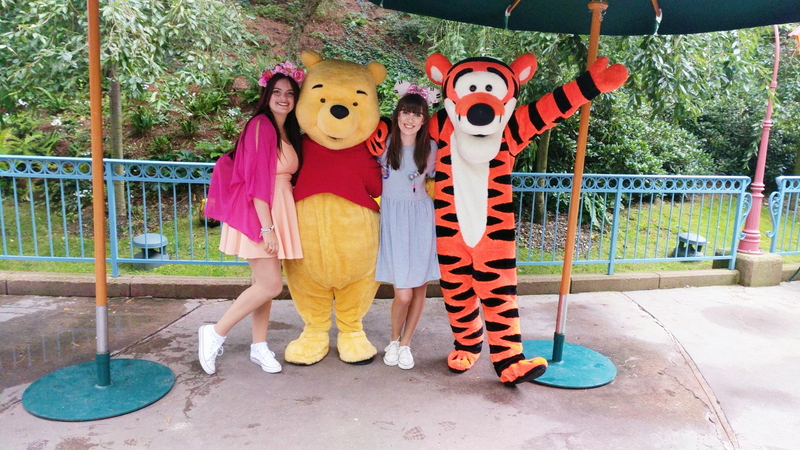 They came running over to us - Pooh went straight to Charlotte and Tigger came to me. He twirled me around and we swayed as we hugged. I swear Tigger gives the best hugs of any character I've ever met - it always reminds me of the hug he gave me in Inventions and it makes me feel all warm and fuzzy inside. Then we swapped - Charlotte got Tigger to say hello to her Mum by jumping in front of the camera whilst Pooh and I shared a big hug and spoke about honey. Then the whole gang joined together and Pooh started to tell us that he was hungry because all the honey had gone. Tigger was super excited so I asked if he wanted to bounce around and he did, eventually, all four of us were bouncing all over the place. Then we posed for some adorable photos, one of which Tigger and I are laughing (which is my favourite). We got another set of big hugs, kisses on the cheek and then we said goodbye and went to find the girls. The sky was getting darker and I could feel the change in the weather - it was cold, windy and we were in for a storm. We sat in front of Castle Stage and told the girls about our adorable meet, and then we felt it. The first drop of rain. Then the second. Then the third. And then the bucket load. It was torrential. We gathered up our things and ran straight over to Star Tours - it was the only ride we could think of that was indoors. 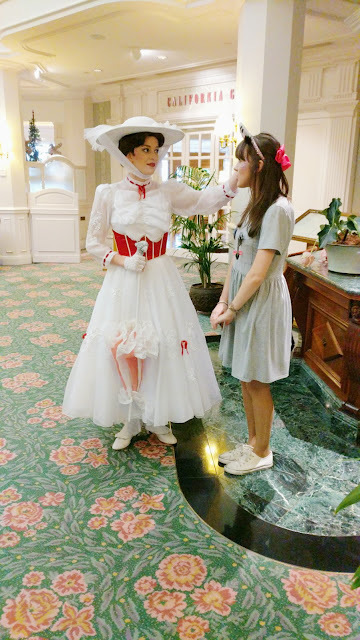 As we were walking through the queue, which is one of the best-themed queues in the parks (and that comes from someone who's never seen Star Wars before), Sara got a text telling her that Mary Poppins was meeting Guests in the Disneyland Hotel. Sara was out of the queue that second. She and Michelle ran straight over to the Hotel, Charlotte, Chloe and I following closely behind. 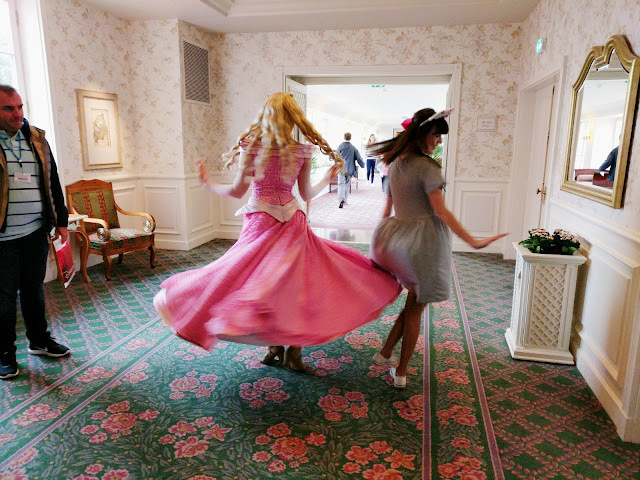 When the three of us finally got into the Disneyland Hotel, we walked straight up the grand staircase and then followed the corridor down to Cafe Fantasia. We were chatting about the weather (obviously) when Chloe just stopped talking and said 'oh my god it's Aurora'. Being the blind bat that I am, I didn't see her until she gracefully swished past me holding a young girls hand, taking her to the window to show her the castle. The minute I saw her I dropped everything on the floor and waited to go and say hello. 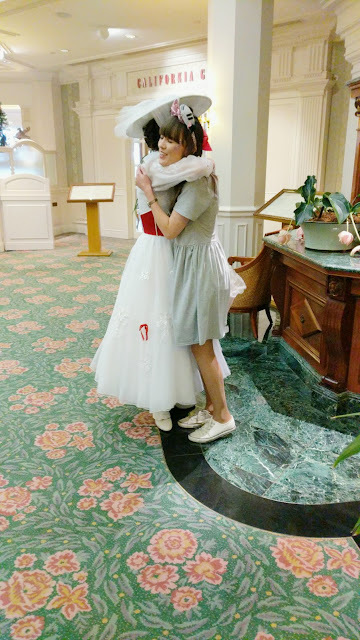 I adore this Princess more and more every time I meet her. When she'd finished meeting the young girl, she came over to me and took my hand. 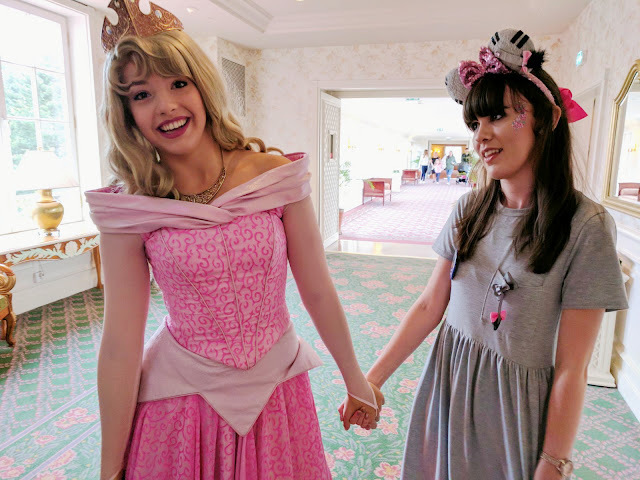 I get so shy when I meet the Princesses - I turn into a little girl and I can't physically speak. I never know what to say because they're so stunning and I look like an out of date potato when I'm stood with them. 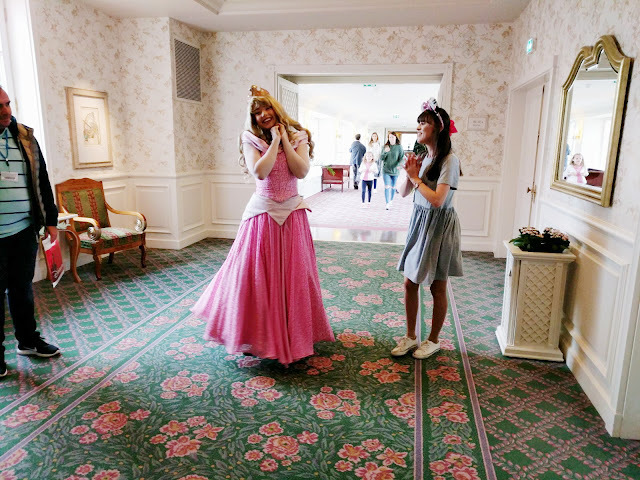 I think I told her that she looked beautiful about three times before she told me that my outfit was made my good fairies and that I looked like a Princess too. 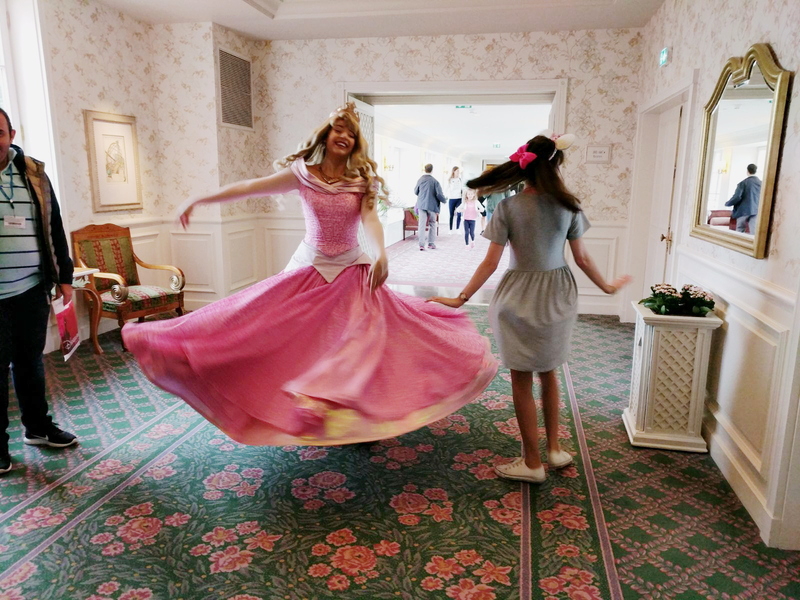 Then she asked me to twirl with her. Yep, you read that right, she actually asked me to twirl. As you can imagine my little heart was going mad because this was a dream come true. She gracefully twirled whilst I looked like an unsophisticated elephant and as you can tell from the way I was looking at her, I was in complete awe. 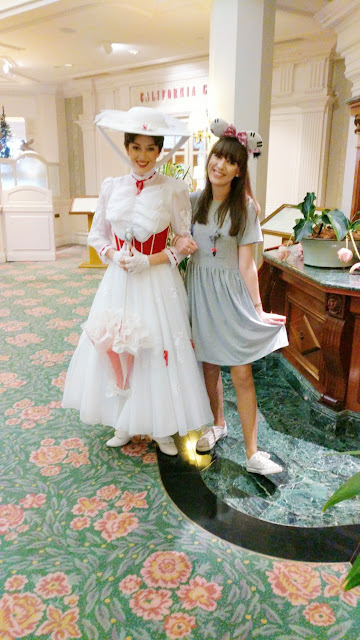 We had another big hug, posed for some photos and then walked hand in hand down to Cafe Fantasia. And onto another magical meet of the day - Mary Poppins. She stood waiting in Cafe Fantasia and she was practically perfect in every way. We had a big hug and we spoke about the weather - we agreed that it was very British and she said that if she could find some sunshine, she'd bring it out for us. Then she told me that she wouldn't be flying because she didn't want to get her coat dirty but that she hoped to see me on parade so that she could come and say hello. We had some photos taken and then before she left, she told us to keep safe, keep dry and if we were still there when she got back, she'd stay and have some tea with us. We sat in the hotel and tried to come up with a plan of action - we could go back to the room and chill out or take full advantage of the park being quiet and get lots of stuff done. As you can tell from the photo above, we went for the second option and had the most hilarious afternoon. When we got out of the hotel the rain was horrendous - it's potentially the worst rainfall I've ever seen - so what did we decide to do? Go on Big Thunder Mountain. I would 10/10 recommend doing this in the rain if you want a once in a lifetime ride experience and the funniest attraction photos. 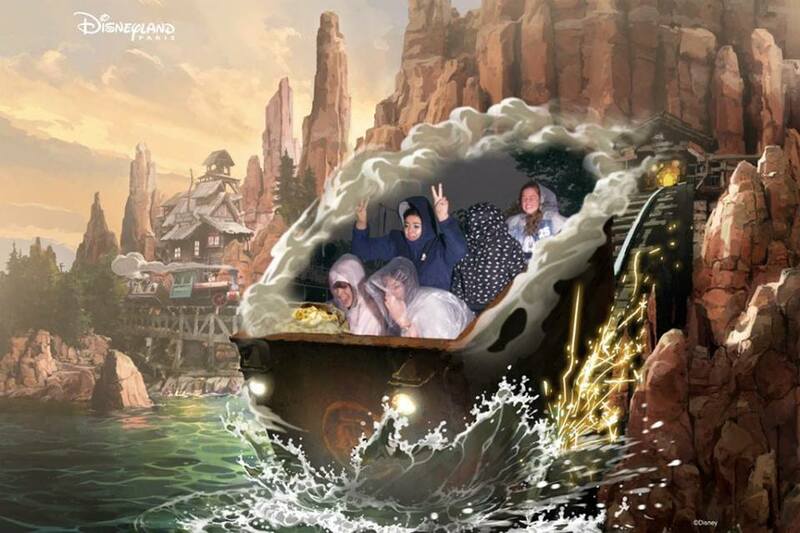 I'll be honest, we didn't think we'd get too wet because of how fast the ride goes, but when the train pulled up and we saw how wet other people were, we realised that maybe it wasn't the best idea. Nevertheless, it's one of my favourite things we did on the trip - I'm laughing just thinking about it. At this point, the rain was soaking into my shoes and it felt like I was constantly walking in puddles. We walked over to Studios and caught the last showing of Mickey and the Magician - another thing you must do if you're planning on visiting Disneyland Paris anytime soon. It's the most beautiful show with such a talented cast - it had me in tears. Then, Charlotte and Michelle went on Tower of Terror whilst Sara, Chloe and I took shelter in Studio 1. We headed back over to the Disneyland Park to do a few more rides, get some food and then call it a night. We did Snow White, Buzz Lightyear, Star Tours and It's a Small World and then stood to get a spot for the parade. I wasn't convinced that the parade was going to happen due to the weather but Disneyland shocked me - yep, you guessed it, the parade actually went ahead. It wasn't the full parade but we got some of the main floats and the interaction was brilliant - shoutout to the amazing cast members who brought us all a bit of sunshine on a rainy day. 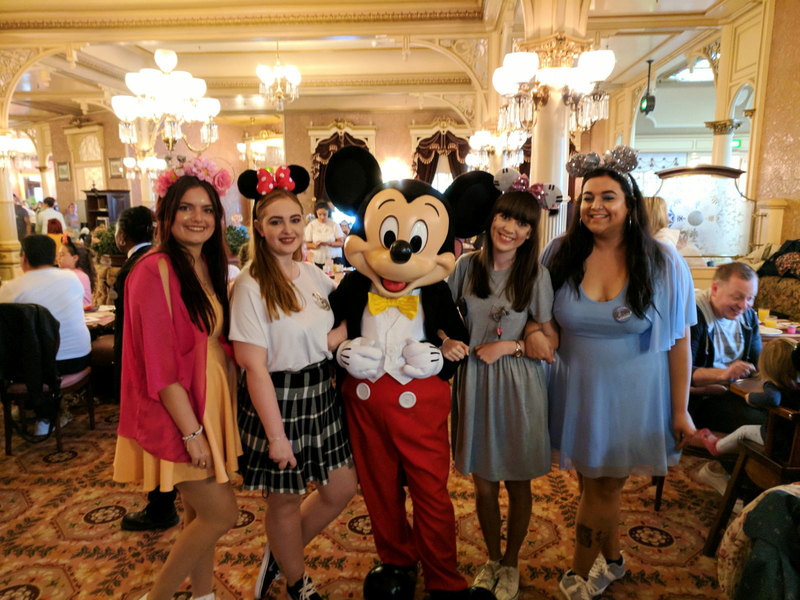 After the parade, we went to Colonel Hathi's for pasta and garlic bread and then headed back to the hotel for a hot shower and bed. Sorry for such a short trip report, not a lot happened because of the rain. I promise day 4 was full of lots of adventures and hilarious character meets!